Boulder, CO • May 12, 2016—Coming together for the greatest union of all time, small and independent craft brewers across the country have created a very special beer in honor of American Craft Beer Week (ACBW), May 16-22. 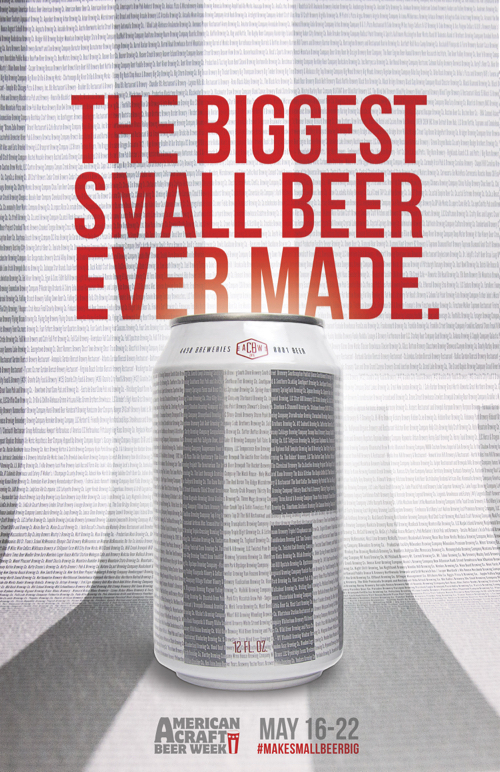 To #MakeSmallBeerBig during the celebratory week, the Biggest Small Beer Ever Made was produced by participating brewers in all 50 states using the same ingredients and recipe. Presented by CraftBeer.com, the nationwide campaign #MakeSmallBeerBig, is amplified through social and digital promotion to showcase the beer and create a unifying voice for the craft brewing community. Visual elements including a graphic and video represent the Biggest Small Beer Ever Made and the more than 4,400 small and independent brewers throughout the United States. The beer, which can be sampled at over 100 breweries throughout the country, was inspired by one recipe. Each participating brewery was invited to brew the beer with the understanding that even with the same recipe, no beer could be exactly the same. American Craft Beer Week revelers are invited to sample the Biggest Small Beer Ever Made at a participating brewery near them. This year also marks the return of the American Craft Beer Week Nationwide Toast. At 8:00 p.m. ET/5:00 p.m. PT on Thursday, May 19, small brewers and craft beer lovers nationwide will raise a glass of the Biggest Small Beer Ever Made or their favorite indie craft brewed beer to simultaneously toast ACBW. To find a toast location near you, visit the official American Craft Beer Week events page. The map contains all other local celebrations, events and promotions for 2016. Find an expanded list of U.S. beer weeks, join the conversation on Twitter with #MakeSmallBeerBig and #ACBW and look for updates on the ACBW Facebook page. This campaign was developed with assistance from Boulder-based agency, Victors & Spoils.